Go back to the public site Lucky you! You're in the My IGN Alpha. One of the best 3D first-person shooters to hit consoles in years. Find out why in our detailed review. Point. Aim. Shoot. The concept behind 3D first-person shooters seems simple enough, but it's the execution (pardon the pun), that makes all the difference. UK-based development giant Rare got it right when it released GoldenEye 007 for Nintendo 64 in late 1997, a shooter that borrowed and polished elements from FPSs on PCs and added enough new ideas to the mix to make the experience a worthwhile one. Since that time, Rare's Bond shooter has remained something of a console FPS benchmark -- still one of the best available, and constantly challenged by newcomers to the market. 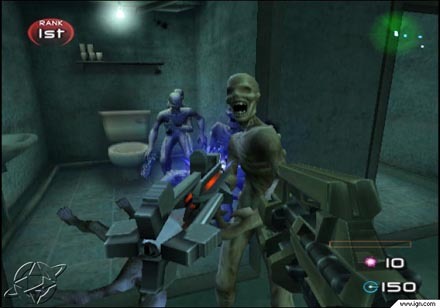 In October of 2000 some former members of the GoldenEye team, as part of new studio called Free Radical Design, released a competitive PlayStation 2 FPS called TimeSplitters. The game was well received due in large to its arcade sense of speed and focus on multiplayer modes, but it was equally shallow, delivering very little in the vein of single-player features. Since then Free Radical Design has been underway with a true sequel, this time unhindered by development time constraints. 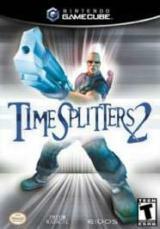 The result, TimeSplitters 2, which arrives now not only for PlayStation 2, but GameCube and Xbox too, is one of the best 3D first-person shooters to hit any system in years. Now complete with a fun single-player mode that will remind gamers of their days playing the N64 Bond, and an unparalleled multiplayer experience to boot, this is a very 'rare' kind of first-person shooter indeed, and it's bound set a few benchmarks of its own. TimeSplitters 2's story is not so much a tale as it is a means to sew together a wide selection of different play environments and styles into one common theme. The year is 2401 and an evil alien race, the TimeSplitters, has arrived -- its one reason for existing to obliterate humans from the universe. As the extraterrestrial threat looms aboard a floating space station, Earth sends its last hope for survival, a duo of elite space marines, to dispose of the danger. After the armed team arrives it learns that nine unique time crystals are the source of the station's power, but even before it can try to destroy them the TimeSplitters take the shards and jump through portals, rocketing backward and forward in time. It's up to players to travel after, kill them, and retrieve the crystals so that the human race can continue its existence. It's an intriguing concept, and while there are cut-scenes throughout the game that highlight the plot developments, the levels themselves feel almost unconnected. It's as if Free Radical wanted to make a mobster-ridden Chicago, a robot world, a Blade Runner-like stage, some Aztec ruins and a Western, but couldn't figure out a feasible way to do it while retaining a storyline. So voila: time travel. From a straight gameplay angle, this isn't a bad thing, the worlds after all are varied and that's a definite plus. But what interest do the TimeSplitters have in 1932 Chicago? We're not sure -- we never saw them there, we only battled mobsters and then retrieved a time crystal. The same can be said for most of the other levels in the game. Still, gamers are likely to instantly forget any story inconsistencies as soon as they begin the first stage. It's set in 1990 Siberia, an obvious throwback to the famous dam level in GoldenEye 007, and it carries with it all sorts of mission goals and objectives from long-range sniping to the disabling of camera systems, using bombs to destroy satellites and more. It's extremely well executed. There is the phenomenally intuitive control setup, precise, speedy and more comfortable than any other first-person shooter ever created for home systems. The dual-analog-stick configuration is fast and friendly to the point where we can safely state that it's the closest recreation of a PC mouse and keyboard to date, and nearly every other element of control is just as finely tuned -- so much so that other FPSs feel weighted and unbalanced by comparison. There is the design of the level, filled with different difficulties of objectives, pacing, and enemy artificial intelligence. 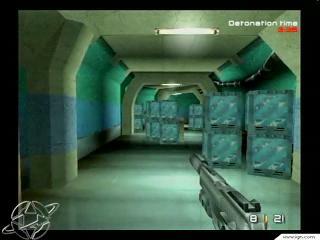 Then there are the gadgets and weapons, of which even in the first stage there are several, from a device that enables players to see where security cameras are stationed so that they can sneak by them undetected, to sniper rifles, shotguns, flamethrowers, timed mines and more. It's just a very complete package and because this is the case the end result is nothing short of excellent. Free Radical has stuffed TimeSplitters 2's single-player mode with solid variety, options and features. First, there are nine worlds to battle through, some of them more entertaining than others. We concede that the game's first stage, Siberia, is arguably its best and most balanced. The list includes everything from 1895 Notre Dame, in which gamers must progress a cathedral while fighting off zombies to 2280 Return to Planet X, a level based on an Martian planet, the 1858 Wild West, 1672 Atom Smasher, 1920 Aztec Ruins, a Robot Factory, a Space Station, and NeoTokyo, a stage ripped right out of the movie Blade Runner. The selection and diversity is commendable, and the developer has done a remarkable job of balancing so that on easy players will need deal with fewer objectives while on hard there are more goals, and enemy gunfire is deadlier. In our experience, all of the levels are fun. But, regardless of difficulty settings a couple of the worlds seem shallow, particularly ones such as Return to Planet X which involves a lot of gunplay and very little brainpower. Plus, as far as innovation goes, there is mostly nothing new in place here -- TimeSplitters 2 has some GoldenEye, some Perfect Dark and some Quake, and it mixes all of these styles together triumphantly, but it's not a pioneering, revolutionary game so much as it is a fine evolutionary one.